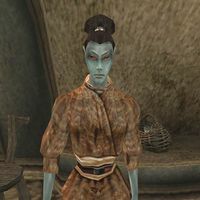 Bevene Releth is a Dunmer clothier who runs a shop in Ald'ruhn. She is one of several merchants in the city who has a problem with Ienas Sarandas's outstanding debts. The Firejade Amulet he purchased from her on credit is still not paid off, and she would like your help either collecting the money or recovering the merchandise. Bevene wears a common shirt, skirt, pants, belt, and shoes. Aside from her natural resistance to fire and the sanctuary provided by her ancestors, she knows no spells. "Greetings, sera. Bevene Releth. Clothier. Quality clothes for less. Stylish clothes for any pocketbook. Shall I tell you about my trade? Or would you be interested in a little work?" (Disposition > 30) "Good to see you back, sera. You know my wares. Quality clothes for less. Stylish clothes for any pocketbook. Shall I tell you about my trade? Or would you be interested in a little work?" "I made a firejade amulet for a customer, Ienas Sarandas. I made delivery, and received my first payment, but Sera Ienas is behind time for his final payment, and I can wait no longer. I will pay you 25 drakes if you will find Sera Ienas Sarandas and either recover and return my amulet, or extract the overdue payment of 50 drakes for me." "No. I can't help you. That's a Western style. No one is interested in that style here. But you might try the High Elf Falanaamo. He has a shop in Caldera, and he specializes in the traditional Western styles." This page was last modified on 20 March 2015, at 02:19.